In December 2018, a new WtE waste plant opened in Changsha, Hunan province, China. This is notable for being one of the largest – if not the largest – waste plants anywhere in the world. It comprises six mechanical grate waste lines, each with daily capacity of 850 tonnes, making a total of 5,100 tonnes per day or upwards of 1.6 million tonnes per year (assuming a 320-day operational year). The main equipment supplier for the plant was Hitachi Zosen of Japan and its European subsidiary, Hitachi Zosen Inova. There is a brief video overview of the plant online here. The company has stated that this is the 20th such project it has completed in China. The operator is Hunan Junxin Environmental Protection Group. Click on the map above to view the exact location. China is continuing to see considerable investment in WtE plants. Since 2013, AcuComm has reported on 580 plants dealing with the WtE incineration of municipal waste around the world. These havve a total estimated value of US$78.5 billion and estimated annual tonnage capacity of over 194 million tonnes. China alone represents around a third of these by value and approaching 50% by tonnage capacity. Source: AcuComm database, February 2019. 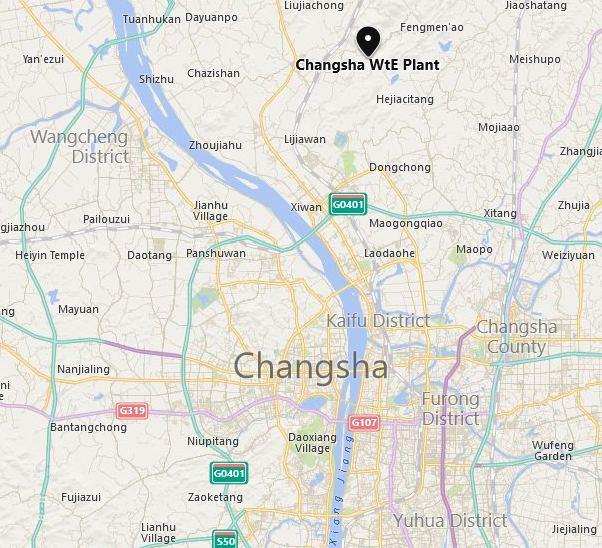 Click here to explore our full listings for Chinese WtE plants since 2013. 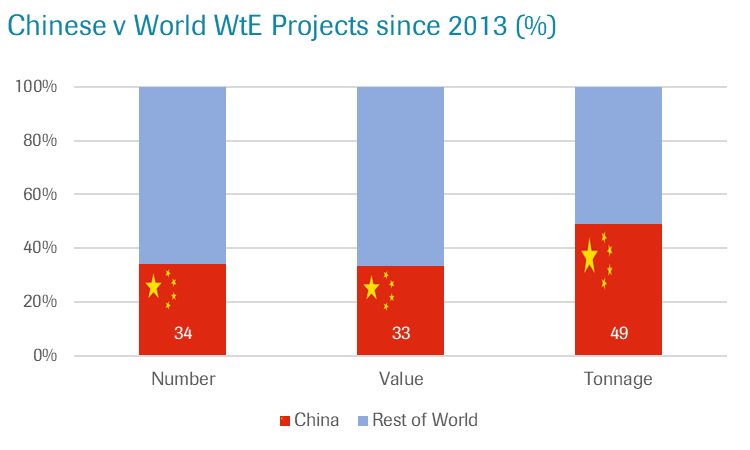 A range of demographic and economic pressures have led to this widespread investment in WtE in China. The traditional method of waste disposal in Chiese cities is landfill. Such has been the growth of many Chinese cities’ populations and economies, however, that existing landfills are quickly running out of capacity. Waste generation levels have risen rapidly, and in some cities approach those found in the West. Space is often lacking for new landfill, especially in the increasingly crowded eastern seaboard, and WtE plants are promoted by city and provincial authorities as a relatively quick and cheap way of dealing with the problem of rising waste levels. Finally, large WtE plants can contribute to a city’s rising demands for electricity. Such developments are not without political opposition, but appear to be widely seen as the best if not the only realistic option on a number of levels. Therefore many of the world’s largest new WtE plants are to be found in China. The Changsha site is just the latest and largest – for now – example.